Can a Simple, Safe, tDCS Device be Built from Radio Shack Components? Transcranial Direct Current Stimulation (tDCS) is an awesome thing. It is reported to help treat or cure depression, pain, effects of Parkinson’s and Alzheimer’s, and can be used to enhance learning and retention. It is the Swiss Army knife of the 21st Century! Many articles have appeared on web sites and publications about tDCS – and in some they carelessly imply that all you have to do for a tDCS treatment is connect a 9 volt battery to your head. That is so wrong (and perhaps dangerous.) The current passed through the head needs to be limited to no more than 2 milliamps (2 ma) and treatments are typically done with current levels of 1 to 2 ma. You can buy a tDCS device for $100 to $500 on the web – and if you have the talent and are so motivated, you can build one, too. There are lots of articles and YouTube videos about building a tDCS device and most involve using voltage regulators, integrated circuits, pc boards and the like. Perhaps, beyond the ability of many to build or have built for them. 1. Could a simple tDCS device be built from very basic Radio Shack components? 2. Could it be made to operate as or more safely than many or most of the tDCS devices described on the web? Two saline soaked sponges are needed to connect the device to the scalp (approx. 3”x3”) which can be cut from common sponges found around the house. However, I decided to order two 3”x3” Amrex Sponge Electrodes from Amazon ($12 each) as they are safer to use and prevent scalp burns which can occur if metal aligator-clips and such come in contact with the skin for a few minutes. i have to be careful with the banana plugs I used; all I could get are the metal shell type. If used in a tDCS session, I’d have to be careful that the shells don’t come in contact with skin. An elastic band is needed to hold the electrodes in place – Target turned out to be a good source (hair band with silicon rubber threads for grip). The circuit I built from the above parts is very simple. 1. I connected a 1k resistor to the negative lead of the 9 volt battery and ultimately to the negative sponge electrode. 2. 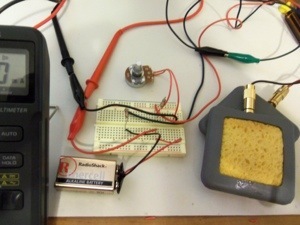 I connected, in series with the positive lead of the battery a 1k resistor, the 5k potentiometer, and the meter – and all of that ultimately connects to the positive sponge electrode. Since current control is achieved only with resistors, a component failure that would be dangerous seems nearly impossible. The downside is that the user must monitor current flow with the meter and occasionally adjust current level with the potentiometer. At the beginning of a tDCS session, current slowly rises as the saline water from the sponges wets the skin. 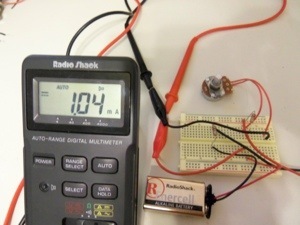 If current rises above the desired target, the potentiometer can be used to adjust the current down as needed. It works and works well. I built this little tDCS device using a breadboard. That is certainly not a durable construction method for day to day use. If I were going to keep this unit, I’d buy a little solder-type PC board from RS and permanently mount the components – maybe build them into a little box. But for this experiment, the breadboard served its purpose. Finally – I always suggest that anyone wanting to use tDCS seek out a professional first. There are doctors around (not many) that are familiar with tDCS and use it in their practice. In Atlanta, for example, is http://www.transcranialbrainstimulation.com . Buying or building a tDCS unit should be your last resort. If you select the do-it-yourself path, first read, read, read about tDCS on the web. There are lots of informational, safety, and montage (where to put the electrodes) articles, papers, and videos – and many more appearing frequently. tDCS is a wonderful thing and I hope it becomes far more accessible to everyone in the very near future. ← Area 25 is Way More Important than Area 51! I have no experience with the product you mention so can’t comment on it. I can’t imagine it would be good for long term use. Recently, I’ve been doing a lot of Internet surfing concerning TDCS and CES. It’s interesting that there a number of companies producing TDCS or CES units, which appear to be very expensive. Yet, there are numerous DIY articles on how to build you own unit. I wonder what makes the commercial units so muc more expensive? The commercial units tend to offer many more features than home-built units. Plus the commercial units (most anyway) are FDA approved – and that costs the manufacturer at lot!